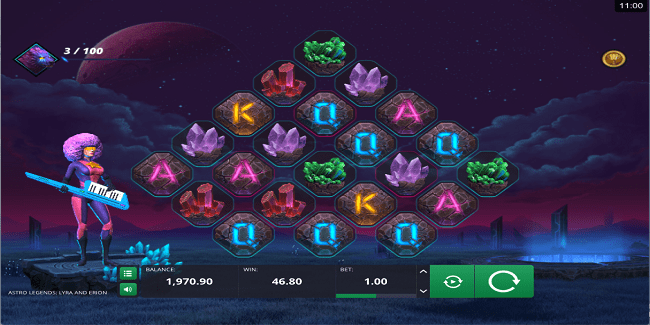 Astro Legends: Lyra and Erion is a Microgaming software platform based online slot machine playable at devices like mobile, smart phones, tablets or Desktop with currencies £0.10 – £10 per spin. This is a sci-fi inspired slot machine which has a great playing environment as well as background sound. Astro Legends slot offers a jackpot of 1000 times on your total stake. Return of player percentage for the game is 96.63%. Astro Legends contains six standard symbols like Q,K,A and a garne, an amethyst and a peridot. The game also has a wild symbols which only appears on middle three reels of 9pink- edged positions). The wild will replace all other symbols on your screen and it will give you a chance to win up to 5x, when you land on wild symbols. There are plenty of Bonus features available in this game and one of them is Sonic Respin. This feature occurs during the base game and all other symbols involved to activate this feature will be locked in place. In this case a re-spin is awarded to the player. A bubble shaped star symbol will float to the screen occasionally and it will be popped up by Lyra, in that case whatever value emerges (2 to 10), then it will be added to the left and corner.